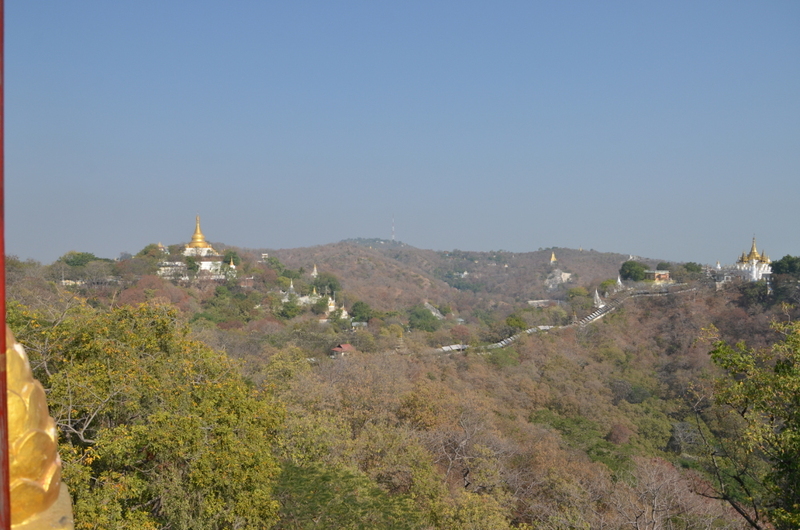 Sagaing Hill « Hansen Inc.
Sagaing hill is not in Mandalay itself, but approximately 20 km south west of Mandalay city centre. It’s a fine place for a day trip. The easiest way to go is to hire a taxi to take you around in the area.We went to a weavers workshop, they operated both semi-automatic weaves and fully manual weaves. The semi-automatic produces the simplest cloth, with only up to 7 colours while the manual ones uses as many colours as the weave-operator can manage and that’s impressively many. 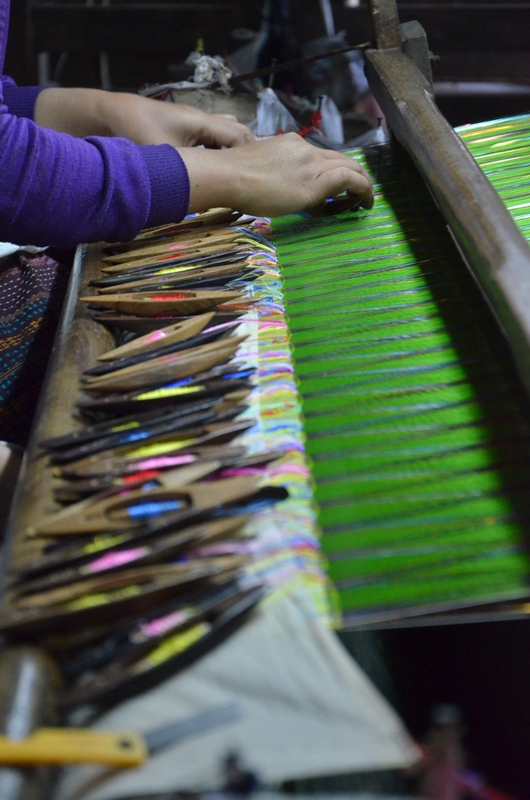 The workshops produces cloth from cotton, pure silk and a mixture of cotton and silk. You find shops that sells the products right beside the workshop. They know that what they produce is of value, so don’t expect to find give away items but you’ll have substantial savings compared to prices in any western country. We paid $20 for a silk scarf. 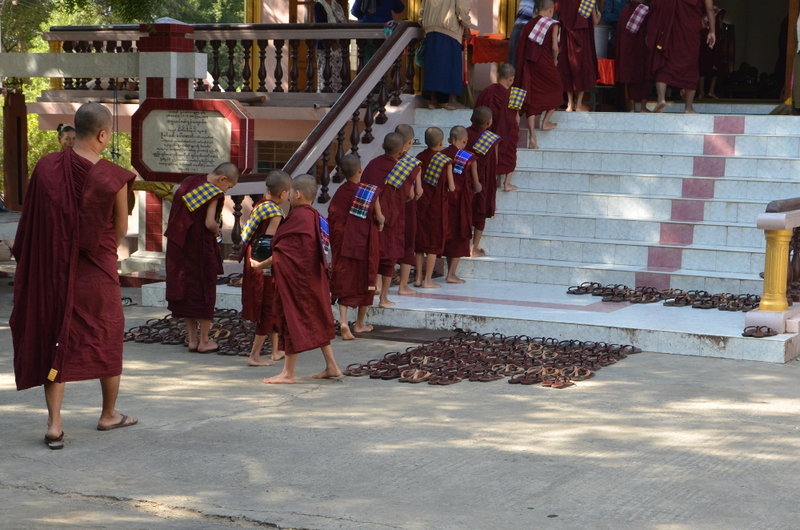 We had read about how you can watch the monks preparing for dinner at Amaypura Monastery. 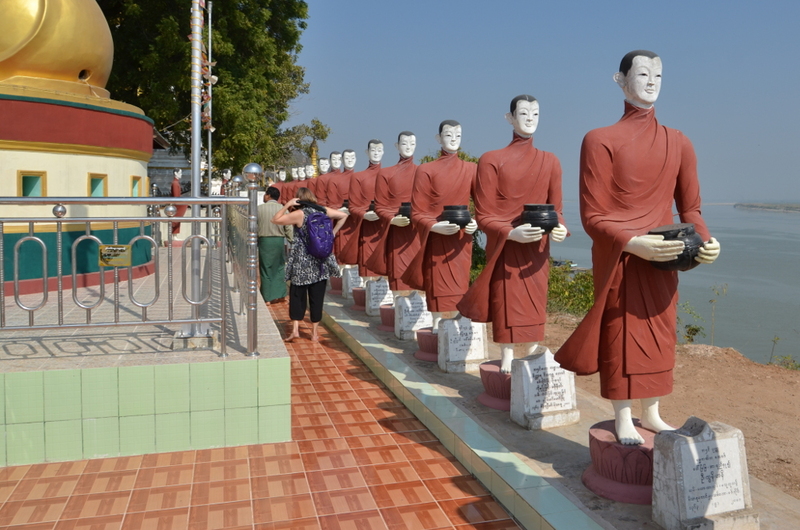 One of the things we had read was that the tourist were almost crowding out the monks, so we didn’t want to go there. We had written of such an event because we think it brings conflicts between the Burmese and the tourists. But while we were driving to Sagain hill our driver told us, that he knew about another monastery where you can see the event and where you’re not in trespassing the routine. So we went there, unfortunately I did not get the name of the monastery, but a few other taxis parked there and let tourists out to watch the event, so I guess that it’s likely that you can get a taxi driver to find it. Every day there will be a sponsor or donor of the dinner. 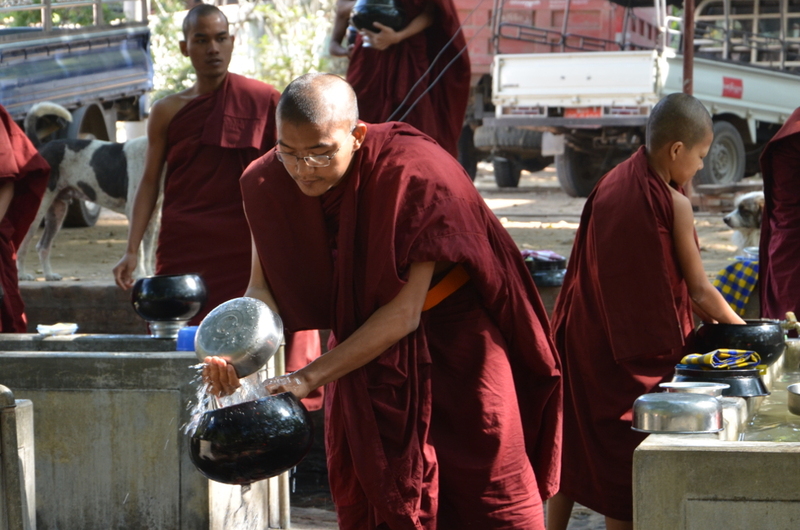 Besides from paying the food the donor will be standing at the entrance to the dining hall to welcome the monks and serve the food. 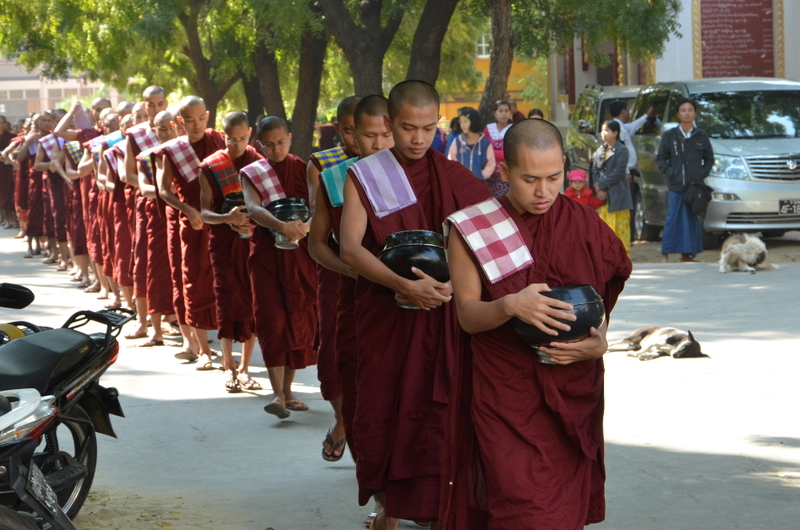 The monks line up in a long row, in the row they are ordered by age, so the eldest is in the front and the youngest in the back. 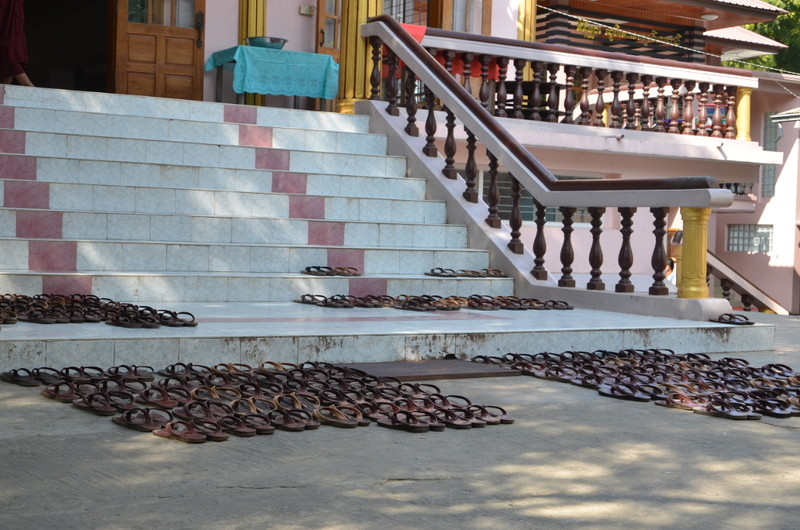 Before getting served they kick off their shoes and place them in front of the stairs. No shoe is placed by random, every shoe is nicely placed on it’s predestined spot, so the shoes are placed in an orderly matrix. There are several large and fine pagodas in the Sagain hill. You must expect to spend several hours on your bare feet walking along the paths of the pagodas. Mostly the paths and stairs are paved with smooth tiles that are properly swept so you can walk safe there.